MUFF WIGGLER :: View topic - why am i so attracted to Wiard? why am i so attracted to Wiard? what is it about this stuff? i can't stop thinking about it. I figured I would order my system and sort of not worry about it 'till it arrives. That's usually what I do with things. But I CAN'T STOP. Everyday, looking at pics of the modules and thinking about patching ideas. Reading the manuals and posts on the Wiard list, often the same ones over and over. just thinking thinking thinking about these damn things. Before I knew what modular stuff was available I wanted a Wiard. It was the first modular in the 'modern era' i became aware of, and I'm not sure how i became aware of them, I think it might have been something to do with Tortoise, but anyway I always sort of knew about Wiard even before i was interested in modulars. I know they have awesome functions and amazing quality and super insane flexibility, and I think they look really cool. But there seems to be something else about them. I don't know what it is. Something intangable. What the hell is it? It's going to sound so flaky to say, but there's some sort of humanity in those modules, that I haven't really seen before in an electronic instrument. Something it seems you can feel from them even if you've never seen one in person. Does this sound crazy to say about a bunch of circuits that I've never actually used? Granted, they are more than just circuits (pun intended). But still. I think terms like 'sonic amusement park', 'cross between an Arp 2600 & a Buchla Music Easel', & 'Chinese puzzle-box', all contributed subconsciously to forming an idea of what the Wiard synthesizer was. It's a combination of hand-crafted, old world and 'earthy', and esoteric & metaphysical. Maybe i'm mad as well, but i do know what you're talking about! Part of it is the designer himself, he knows that its ok to make music without a keyboard, he designs these modules to accommodate users that have goals other than "hard acid riffs" and "phat bass lines." Although when patched in the simplest "east coast" way, there is no reason that a wiard system could not do the things that most "traditional dabblers" look for. The other appealing draw is that 1 300 panel is equal to the functionality of 3 other modules. That 6 space 300 system you have picked out is the equivalent of atleast an 18 module system. And they appear to be of superior build quality, and hand made with great pride in the USA by one man. confirmed that my assumptions I had of Wiard modules were true. The Wiard system is my ultimate system as well, ideally it suits my inspirations for sound exploration matched with superior build quality assembled by a man who is capable of understanding the attraction to the sounds I would gravitate towards creating with it. I don't think I can really put into words how much the 300 system perfectly suits my ideal needs, but I feel that I share a lot of the same reasons as you. Before I knew what modular stuff was available I wanted a Wiard. Right when I started planning out my modular I knew I wanted a Wiard setup. yeah i feel the same way, normally i am able to place an order and just not worry about it. i waited 18 months or so for my ampex 1" 8 track. and i have waited over 6 months for other custom gear on more than 10 occasions. I know the feeling! I see the Serge in a similar way and I obsessed about it until my first two panels finally arrived. I still think about it so much during the day, I should have it at work! Oh, one of the crazy things I did was read every single message in the Serge Modular Yahoo Group archive. I picked up a lot of good information that way, though! I should have it at work! "ahh, it is a new combobulator that refines my report writing skills down to a fine art.... and makes awesome weird noises too"
yeah, i don't think so! i turn to programs and languages that i can use on my work PC. otherwise, as soon as i'm in front of the modular, the computer takes a backseat! i remember when i first learned of modulars. someone pointed me to doepfer at Analogue Haven. somehow, not long after, i found the wiard site. found the JAG page and was fascinated with the picture and immediately made it my wallpaper. gosh i stared at that thing a lot. you just can't help yourself but love the system. i think about music all the time so wiard is just part of that. i don't want to say i'm obsessed but totally see where you're coming from. Omg, that would be torture. It's bad enough that I tempted to fire up the forum while I'm waiting for my computer to reboot. I would not be able to get any work done if I had a synth in the office. what is it about this stuff? i can't stop thinking about it. It's a self-defense mechanism, designed to distract you from what you need to do right now. The more time we think about what to do in the future, the less time we spend actually *doing*. It's a 4-dimensional machine from a synthesist/musician who understands and respects both music and the elusive aspects of art, especially as they relate to a music/sound/art-making machine. Look at his DIY page; he even relates the Exquisite Corpse to sound and music. Don't miss Grant's explanation of envelopes and how to use the Envelator. There is tremendous depth in this device alone, significantly superior to any other design, even surpassing in ways the circuitry it was inspired by. The high-level concept and artistic metaphor and their relation to sound, music, and equipment concepts/behaviour have basically been shouted down from consideration in our field, extremely sadly, but when it does occur, it's most often found among Wiard enthusiasts. Congrats upon taking this path. Add a Mixolator and you're in for serious exploration. Comining the two continuously-variable slopes (Envelator feedback and Mixolator response) and you can produce a vast range of characteristics missing from lesser machines. thanks Mike - you pretty much perfectly summed up how I feel in answer to the question I opened this thread with. That is exactly what attracts me to Wiard - however coupled with my experience with the 1200 series modules I own, which only reinforces what you say. It's easily the system I am most attracted to - of all time. 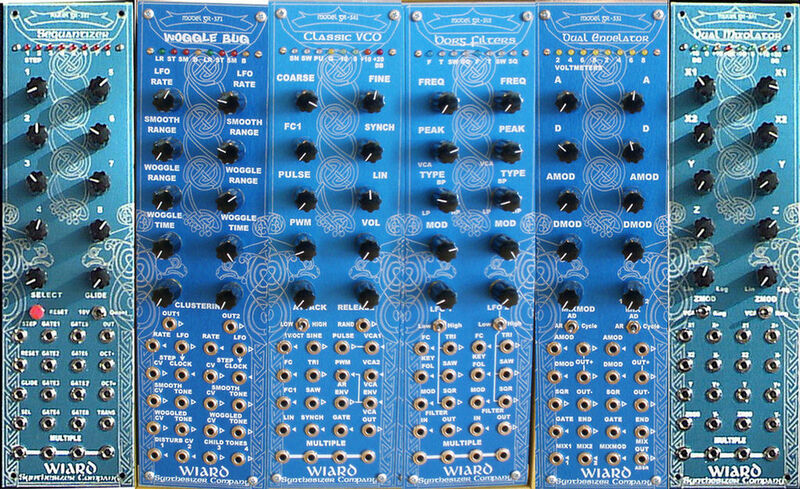 The machines that have always had the most attraction to me are Serge, Buchla, EMS and Wiard - and quite honestly a Wiard 300 is something I would prefer over any single one of those - even an EMS which I've wanted for just about as long as I can remember wanting anything. So Muff-- when do you expect the modules to start arriving? Can't wait to hear your impressions! How "snappy" is the envelator? this got me interested.. pretty snappy! i know how the Cwejman sounds. hmmm let me rephrase it then.. will the Envelator be as fast and clean sounding? I've had my 7 module system for about 6 months now. While I like my Blacet system, I LOVE my Wiard. For me it's a whole package, I like quirky, it's deep (very) and more it feels very integrated. The standard patch shows an odd module layout to my eyes, but Grant explained to me the reason, it does all make sense. He says it opens up like a puzzle and it does. I always felt someone that went to the trouble of decorating the modules in the way he has would have concerns over and above the basic functionality of the system. I feel the same way I guess. Having something that you know is someones labor of love, and knowing that that someone has a long history in the field and has earned respect by many.. Owning an instrument like that makes it a personal experience, and that is something that drives (me at least) to want to use, explore, and enjoy the instrument. Even if there are more powerful, bigger etc things out there. I feel this way about my Spectralis. It is one mans vision that has been labored over for 5 years. There is direct connection with the designer on the fourm, answering questions and with feature requests. Its rare, obscure.. The first hundred or so were actually built by him. Not exactly like the Wiard thing, but compared to MC505 , ER1, etc - you get the point. Long live and good luck to the "Cottage Industry"! I dunno, but whatever it is, I think I'm getting it too. next thing I know I have 2 modules, order placed for a PSU + 4 more modules! + Im planning a wooden body casing for the set! At first I didnt know how I would even acquire the funds to get more than 2 modules, but lo and behold, the monies have serrendipitously come into my life, seemingly just in time for this new musical endeavor! Amazing. I cant wait for my system to arrive & come together! I remember the snappiness of the SH101 / MC202 envelopes, and now I know how they work, the mystery can be revealed ... as poor engineering. It's just DC feedthrough of the control signal into the audio path by the VCA. Congrats Illwiggle, hope you enjoy the system.